I’m currently on my way home from Hilton Head and you can bet your bottom dollar that I have some form of chocolate in my hand. I hope you guys enjoyed the guests posts while I was away. I can’t wait to share some of my trip with you tonight when I get back. Now that the kids are older we don’t have a big neighborhood gathering, but my own family still goes to Church and then brunch at our Country Club. And of course my mom leaves us baskets full of chocolates and peeps. She is OBSESSED with peeps and gives us them on every single holiday even though none of us like them. Her obsession comes from that Shaggy song ‘Angel’ that says “closer than my peeps you are to meeee….”. My mom is cute. Wishing you a wonderful, Blessed, chocolate-filled day! Yumm…my mom gives me peeps, as well. The difference is I love them!! Hoppy Easter, Clare! 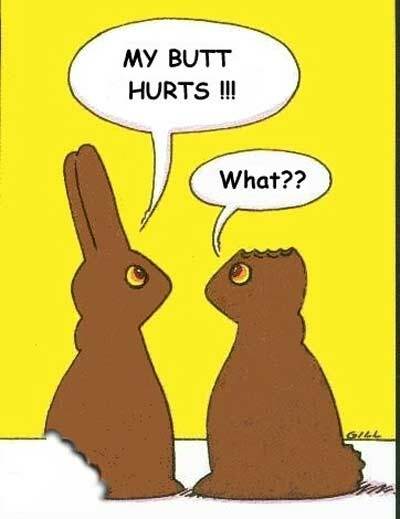 Enjoy your chocolate! I havent had a peep in so long, but I love them! Happy Easter girl! Have a Happy Easter Clare! The little of your post reminded me of the card my brother gave me this morning! On the front it was an egg and said happy easter and on the inside it said “too one of my favourite peeps” and a picture of a baby chick comming out of its egg! haa the cutest! haha awww your mom sounds so cute!! I just can’t get into the Peep craze. I have enough family members to share them with though. Someone made a Peeps s’more and that might make me a convert.